A new documentary about Beyoncé's 2018 Coachella performance has just dropped and she's also released a new album. 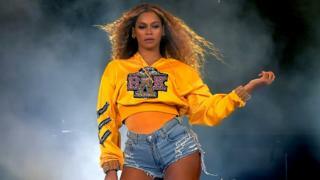 The new album is called Homecoming: The Live Album and features the full song list from Beyoncé's legendary Coachella 2018 performance, including the live versions of Sorry and Drunk In Love. Netflix has even changed it's social media handle to Beyflix! There are also rumours that Beyoncé will be dropping ANOTHER completely new album on 18th April after the song lyrics site Genius created a new entry for a Beyoncé album called 'B7'. The B7 image is yellow - the colours of the Homecoming poster and one of Queen B's famous outfits for her Coachella performance. Apple music have also updated Beyoncé's profile photo on their streaming service prompting fans to wonder if another new album is coming. Hold up - back to the Homecoming documentary! So how did Beyoncé get on with creating such an huge show, that left audiences around the world talking about it for weeks and renaming the popular festival Bey-Chella? This documentary takes a behind-the-scene look at Beyoncé's life and her journey to the 2018 Coachella performance. Here are five things we learnt about Queen B's journey from the Homecoming documentary, if you don't want any spoilers we suggest you stop reading now! The documentary is over two hours long but for Beyoncé fans it's worth the watch. The opening sequence is of the famous 2018 performance and more footage of the performance are scattered throughout. Beyoncé was the first African-American women to headline Coachella and said she wanted to bring her culture to the stage. She talks a lot about her culture, but also about staying true to yourself and being proud of who you are - those are all big themes that run throughout the performance. Beyoncé wanted lots of different types of people to be represented in her Coachella performance. She said, "There was no rules - we were able to create a safe free space where none of us were marginalised." "It was important to me that everyone who had never seen themselves represented felt that they were on that stage with us... I wanted everyone to feel grateful for their curves, sass, honesty and freedom - there were no rules". Famous dancer, choreographer and baton twirler Diddi Emah, who performed at Beyoncé's Coachella show, echoed those thoughts: "I thought I'd be too short, too thick - to have things that black families value up on stage for the world to see and for them to understand us that little bit more is just all a blessing". Historically black collages and universities (HBCUs) inspired the outfits and the dance moves that were in her performance. Beyoncé didn't get a chance to go to college because she was so busy with her girl group Destiny's Child but said she would have loved to have gone and would have chosen to go to a HBCU. HBCUs are universities in America that were established before the Civil Rights Act of 1964 when lots of schools were still segregated. This meant that people of different colours were not allowed to go to the same schools - so universities were created for the African-American community because at the time they weren't allowed to go to the universities white people attended. From getting the band together to practice with the dancers, the process of planning the performance took about eight months. 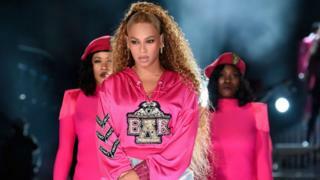 That's without time to plan how she would sing the songs, "It felt like we were in our own university and struggling together - the hours were unbelievable" according to Bey. The year before the now-famous performance, Beyoncé had given birth to twins Rumi and Sir. The documentary shows never-before-seen video of the superstar's life including having the twins, the health issues she faced after their birth, her fight to prepare for THAT Coachella performance and even her wedding ceremony to husband and rapper Jay Z. This seemed to be one of the hardest times for the singer, she said, "There were days that I thought I would never be the same... I pushed myself further than I thought I could and I learned a valuable lesson, I will never push myself that far again". Beyoncé planned every part of the performance, she even personally selected every dancer, every light on stage and designed the set. 5. Blue's dance moves are EVERYTHING! Bey's family made an impact on rehearsals and was a big part of the performance. Family members and close friends were not only in the performance but were around all the time behind the scenes. 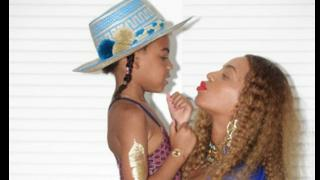 Blue Ivy, Beyonce's oldest daughter makes several appearances in the documentary, from cutting some shapes to getting exited and singing to people. From the video she looks to be enjoying singing just as much as her mum did when she was her age - who knows, we could have another superstar on our hands. Talking about her family the Lemonade singer said "My family is the biggest priority in my life, my family is my sanctuary, my weakness and my strength". Beyonce's 2018 Coachella performance seems to be one of those that will be talked about for years to come. The documentary gives us an unusual insight into the life of a celebrity that is usually very private, but on her own terms, of course. The singer said she hoped to inspire people with her vision and hard work, "I'm so lucky and grateful that I am able take all these crazy ideas and make it into something that heals people and may spark vision in people that shows them to dream big, that shows them that they are limitless. It's possible".